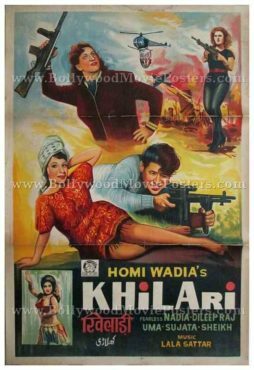 Old hand painted Bollywood movie poster of the Fearless Nadia Hindi film, Khiladi (1968) for sale. Featured here for sale is an original vintage hand painted Bollywood movie poster of the 1968 Indian film that starred Mary Evans, better known as “Fearless Nadia” or “Nadia Hunterwali” in the lead role. Born in Australia, Fearless Nadia was one of the earliest actresses in Indian cinema to star in lead (primarily women-oriented action-packed) roles. In her illustrious career, Fearless Nadia starred in dozens of films produced and directed by Homi Wadia, starting from her debut in the film Hunterwali (1935). Khiladi was Fearless Nadia’s last role in films, making this poster, highly collectible! After a gap of nearly a decade, Fearless Nadia returned to the big screen in her late fifties in the film Khiladi. Her flamboyant James Bond styled character code-named “Living Fireball” was the highlight of the film. Printed and circulated during the original release of the film (late 1960s), this hand painted Bollywood movie poster was originally designed for publicity of the Fearless Nadia film but never ended up being used. This old Bollywood poster features quirky hand painted artwork and was designed originally on canvas. Fearless Nadia is seen in her stuntwoman element, wielding machine guns in this very vintage hand painted Bollywood movie poster. A flying helicopter is seen with explosions in the background, suggesting the action packed theme of the film.